The Douglas E. Goldman Jewish Genealogy Center operates as an integral part of the Internet and Databases Department of The Museum of the Jewish People at Beit Hatfutsot and provides a service to the general public in the field of Jewish genealogy. The Douglas E. Goldman Jewish Genealogy Center operates a center for visitors, which is located The Museum of the Jewish People at of Beit Hatfutsot and which is intended to serve visitors to the museum. In addition to the visitors center, the Douglas E. Goldman Jewish Genealogy Center provides services via post, e-mail, telephone, and Website of The Museum of the Jewish People at Beit Hatfutsot. The Douglas E. Goldman Jewish Genealogy Center has as its goal the task of storing genealogical data about Jewish families from all periods and from all Jewish communities in Diaspora and Land of Israel. The collection of this data is intended to document the history and the heritage of the Jewish people and to preserve it for the benefit of future generations, in accordance with overall mission and aims of The Museum of the Jewish People at Beit Hatfutsot. The objective of collecting the genealogical data is to highlight the history of Jewish families down the generations by reconstructing their chronicles in every place and time. The Museum of the Jewish People at Beit Hatfutsot believes that the gathering and preservation of this data significantly enriches the understanding of the past of the Jewish people in all the places to which they were scattered. In addition there is other information at the Douglas E. Goldman Jewish Genealogy Center which has been collected by the center itself or as the outcome of other activities conducted at The Museum of the Jewish People at Beit Hatfutsot, including educational programs. This information is partly contained in the database, partly on non-electronic media such as books, documents or any other publication or on microfiches owned by The Museum of the Jewish People at Beit Hatfutsot, and including photocopies of population registration documents from Jewish communities in the Diaspora. The submission of genealogical information to The Museum of the Jewish People at Beit Hatfutsot is done on the basis of voluntary agreement of the party furnishing the information and on that party’s responsibility alone. The right is reserved to the party submitting the information to demand from The Museum of the Jewish People at Beit Hatfutsot to block public access to certain parts of the family tree submitted by him, subject to the technological limitations of the database housed at the Douglas E. Goldman Jewish Genealogy Center. The right is reserved to the person submitting the information to demand, at his discretion, from The Museum of the Jewish People at Beit Hatfutsot the removal of the family tree he has submitted, or parts thereof, from the database of the Douglas E. Goldman Jewish Genealogy Center. The Museum of the Jewish People at Beit Hatfutsot reserves the right to refuse to include in the database of the Douglas E. Goldman Jewish Genealogy Center a family tree or parts thereof, in accordance with a decision of the Douglas E. Goldman Jewish Genealogy Center. The party providing the information will have no right of appeal against such decision to any body, legal or otherwise in Israel or in any other country. The Douglas E. Goldman Jewish Genealogy Center, which operates at The Museum of the Jewish People at Beit Hatfutsot in Tel Aviv, Israel, is an integral part of the museum and all the laws and procedures which derive from the legal status of The Museum of the Jewish People at Beit Hatfutsot, govern it in accordance with the bylaws of the museum and all the remaining agreements and undertakings pursuant to which Beit Hatfutsot operates, and subject to the laws of the State of Israel. This status makes it obligatory for any person who gives genealogical information to The Museum of the Jewish People at Beit Hatfutsot, whether he holds Israeli citizenship or the citizenship of another country, to consider as relevant Israeli law alone on any matter and subject which has or could have legal aspects connected with the safeguarding of the information, the rights over the information, and any dispute regarding ownership of the information, and/or the correctness of the information contained in the databank of the Douglas E. Goldman Jewish Genealogy Center. The database at the Douglas E. Goldman Jewish Genealogy Center is exclusively owned by The Museum of the Jewish People at Beit Hatfutsot with everything that this entails according to the Protection of Privacy Law of the State of Israel, and subject to the Israeli law and the general bylaws of The Museum of the Jewish People at Beit Hatfutsot. 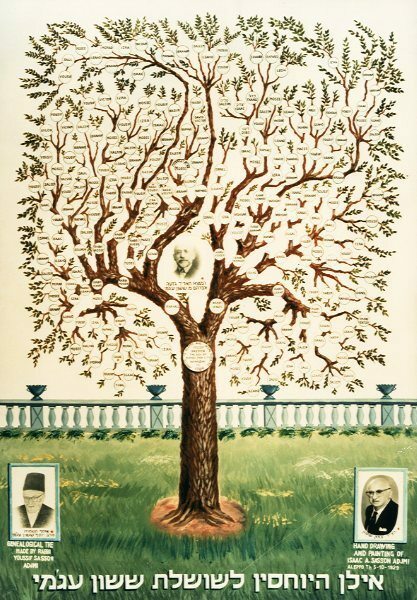 However, the ownership of any and every family tree that has been submitted to The Museum of the Jewish People at Beit Hatfutsot belongs to the party who submitted the family tree or to his representative. As a consequence of this, full rights are reserved to the party who submitted the family tree regarding the inclusion or non-inclusion, and the display or non-display of the family tree he submitted to Beit Hatfutsot, or of portions thereof, or of any type of information contained in the databank of the Douglas E. Goldman Jewish Genealogy Center. The Museum of the Jewish People at Beit Hatfutsot undertakes not to pass on to a third party any information contained in any family tree without the express written consent of the party who submitted the tree and/or his representative. This means that Beit Hatfutsot will not pass on a complete family tree without the express consent of the owner of the family tree. The Museum of the Jewish People at Beit Hatfutsot is not responsible for the content and substance of the information, in all its classes and types, which has been furnished to the Douglas E. Goldman Jewish Genealogy Center. 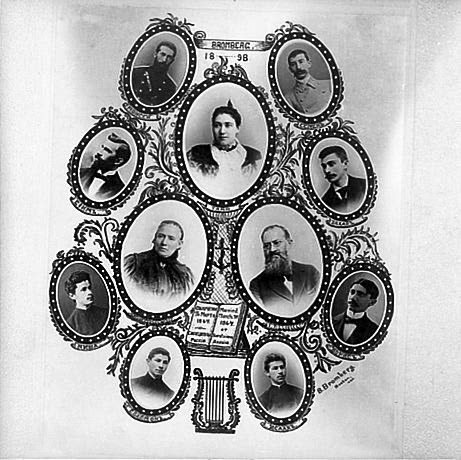 The responsibility for the content of the information, including the correctness of the data and the manner in which the same are presented, and regarding the inclusion or non-inclusion of any item of data or of any detail given to Beit Hatfutsot, falls exclusively on the party who submitted the information – namely, the owner of the family tree or his representative. The Museum of the Jewish People at Beit Hatfutsot is not responsible in any manner or form for any use which may be made by any person, company, institution or organization in Israel or in any other country, of any types of information that have been given to such party or parties by the Douglas E. Goldman Jewish Genealogy Center. The Museum of the Jewish People at Beit Hatfutsot is not responsible for anything recorded in a family tree or in any other source of information given to it with regard to any matter likely to damage the good name, the feelings, dignity, body, property and/or standing of any person recorded in the family tree, whether such person is alive or dead. However it is agreed by a party who submits the family tree that no information will be supplied by him which is likely to damage the good name, dignity, feelings, body, property and/or standing of any person, whether such person is alive or dead. In the event that such information has been given, Beit Hatfutsot may, if this becomes known to it as a result of conducting an internal investigation and/or as a result of an application by a third party, refuse to include such information in the database owned by Beit Hatfutsot, or may demand from the owner of the specific family tree, or his representative, to amend or to delete the data recorded therein, all as the case may be. This does not oblige Beit Hatfutsot to conduct an investigation of its own concerning all or any information submitted to the Douglas E. Goldman Jewish Genealogy Center. The Museum of the Jewish People at Beit Hatfutsot is not responsible for any medical information given to it in any family tree, and such information cannot serve as legal proof with regard to the medical condition of any person recorded in the family tree, or of his descendants, or of his remaining family relatives through all generations. The Museum of the Jewish People at Beit Hatfutsot is responsible for protecting and safeguarding the information contained in the database of the Douglas E. Goldman Jewish Genealogy Center in accordance with the Law for Registration of Databases of the State of Israel. The Jewish Genealogy Center does not constitute a separate legal entity, but forms an integral part of The Museum of the Jewish People at Beit Hatfutsot. A person who submits the family tree, or his representative, undertakes to answer, within a reasonable time, inquiries addressed to him by visitors, researchers or applicants to the Douglas E. Goldman Jewish Genealogy Center, who are interested in obtaining more particulars with regard to the information contained in the family tree which the party submitting the family tree registered at Beit Hatfutsot. The Museum of the Jewish People at Beit Hatfutsot undertakes to see to it that the contents of these bylaws will be brought to the knowledge of the entire public, including to persons who submitted family trees in the past and submit family trees in the future.